Hand Mortars. Classic Arms and Militaria, Volume XXI Issue 6 Feb/Mar 2015. The Hillside Escalator Link. The Journal of the Hong Kong Branch of the Royal Asiatic Society Vol.54 2014. Two Breech Loaders. Classic Arms and Militaria, Volume XXI Issue 6 Dec/Jan 2014. A Superimposed Load Pair of Pistols. Classic Arms and Militaria, Volume XXI Issue 3 June/July 2014. Laugher Pistols. Classic Arms and Militaria, Volume XIX Issue 4 Aug/Sep 2012. Hospitals on the Peak. Journal of the Hong Kong Branch of the Royal Asiatic Society Vol.51 2011. The Good Eggs. Classic Arms and Militaria, Volume XVIII Issue 5 Oct/Nov 2011. Tranter and Cooper, two cased Pairs. Classic Arms and Militaria, Volume XVII Issue 2 Feb/Mar 2011. Triple Power - Three barrel tap-action pistols. Classic Arms and Militaria, Classic Arms and Militaria, Volume XVII Issue 6 Dec/Jan 2011. 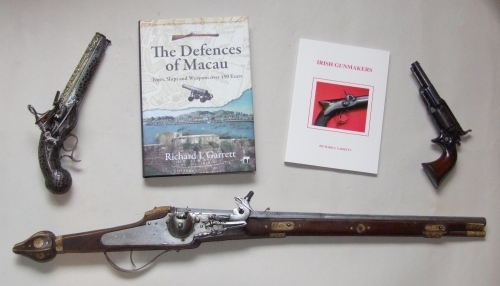 Pirates in the South China Sea and Their Weapons. Classic Arms and Militaria, Volume XVII Issue 1, 2010. John Blissett’s Patent Ramrod. The Journal of the Arms & Armour Society, September 2009. The Hotchkiss Machine Gun. Classic Arms and Militaria, Volume XVI Issue 4, 2009. Hotchkiss and his Guns, Part Two. Classic Arms and Militaria, Volume XV Issue 6, 2008. Hotchkiss and his Guns, Part One. Classic Arms and Militaria, Volume XV Issue 5, 2008. Concealed Weapons, Single-barrelled Pocket Pistols. Classic Arms and Militaria, Volume XV Issue 1, 2008. Snaphaunce, Frizzen & Sear. The Flintlock Holster Pistol, Part 2. Classic Arms and Militaria, Volume XIV Issue 2, 2007. Snaphaunce, Frizzen & Sear. The Flintlock Holster Pistol, Part 1. Classic Arms and Militaria, Volume XIV Issue 1, 2007.